Dr Michelle Brazier (Osteopath) is a highly skilled and experienced Osteopath who grew up locally in Aspendale. Michelle graduated from Victoria University, completing a degree in Clinical Sciences and a Masters of Osteopathy. During her five years of study, she gained valuable experience working as an accredited sports trainer for a number of local AFL clubs. In addition, Michelle has completed postgraduate courses in dry needling (Manual Medicine Australasia) and kinesiology taping (Rocktape Australia) – both of which are great conjunctive therapies to Osteopathy. She has a particular interest in the treatment of headaches, disc injuries and posture-related pain. Michelle is a passionate, committed and dedicated Osteopath who offers a caring and customized treatment approach for each individual patient. She loves working with clients from all walks of life – from office workers, trade workers and athletes, to children and retirees. She endeavors to get people back to what they love doing most – be that pottering around the home and garden, or returning to sport. 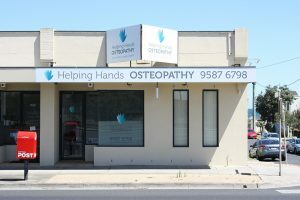 If you’d like to make an appointment to see Dr Michelle Brazier at Helping Hands Osteopathy, call (03) 9587 6798 or you can Book Online via our website or the Helping Hands Osteopathy Facebook page.